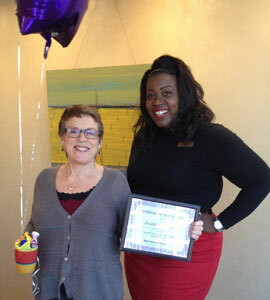 Chabre Vickers, Director of Community Relations & Diversity Programs at Big Brothers Big Sisters/Columbia Northwest surprised HLGR’s Assistant Director of Administration on January 17, 2013, personally delivering a framed certificate of appreciation­–along with balloons and treats–for being an outstanding mentor (pictured left). In the words of the program’s community outreach director, the program chose “a tiny fraction” of those people for special recognition as outstanding mentors today. Joanne was one of those honored few. Congratulations Joanne! We are all moved by your volunteerism and dedication to others.